It is a white flag divided by two light blue horizontal stripes and a light blue 6-point star in its centre. It is a blue flag with white Italics "SCBG" at the hoist, flanked by two white oars and a white sail, which is at the fly. The flag displays a golden radiant sun. His centre is in the lower hoist cornerer and charged with a blue capital "H". As Helios had been the Greek God of the sun, the pattern is canting. Name: Berliner Ruder-Club 'Hevella' e.V. It is a white flag with a light blue centred cotized cross and a shield divided per fess with a white chief and a red base. The white flag was divided by a white cross fimbriated blue. Within the horizontal crossbar was a blue inscription "HEVELLA". Name: Sport Club Berlin Köpenick e.V. It is a plain white flag with four upright rectangles, three of them olive but the second one red and shifted slightly towards the top. Above the rectangles towards the fly is a n olive "SC", below the an olive "BERLIN" . Name: Berliner Ruder-Club "Libelle" e.V. The white flag is divided by two black horizontal lines. In the centre of the flag between the lines is a black 6-point star. The flag has a white canton fimbriated black containing a black, serifed initial "L". In the centre of the white flag was a black, serifed initial "L", surrounded by a black annulet. It is a white flag with an inverted green scandinavian cross, i.e. the intersection-point of the crossbars is shifted to the flyend, superimposed by a black scandinavian cross, the black horizontal crossbar is straight below the green one. In the canton is a black eagle. Name: Die Ruder-Union Marathon von 1980 e.V. It is a light poisoneous green flag with a yellow compass rose in it's centre. In the four corners are yellow capitals: "D"(upper hoist), "R"(upper fly), "U"(lower hoist) and "M"(lower fly). Name: Oberschöneweider Ruder-Verein "Meteor" 1904 eV. The white flag was divided by a blau-white-blue, centred cross. In the quarters were blue inscriptions "O" (upper hoist), "R" (upper fly), "V" (lower hoist) and "M" (lower fly). In the centre of the flag is a small white disc, fimbriated blue. It is a red over white over red horizontal triband with a red "N" in the white stripe. Name: Berliner Ruder-Club "Neptun" e.V. The white flag is divided by two pairs of red, horizontal lines. In the centre of the flag between the lines is a red 6-point star. The flag has a white canton fimbriated red containing a red, serifed initial "N". The club has nothing to do with RC Neptun, established 1877-1883, which had joined Berliner RC in 1883. Thus BRC "Neptun" must have been established after 1883. Name: Berliner Ruderclub "Oberspree" e.V. The white flag is divided by two black horizontal lines. In the centre of the flag between the lines is a black disc cotized white black. The flag has a white canton fimbriated black and divided by a black saltire with black inscriptions "B" (top), "R" (hoist), "C" (fly) and "O" (bottom). It is a white flag divided by four light blue, embowed fields, emerging from the upper hoist corner. The white canton has a golden fimbriation and an inscription "SVO" of the same colour. In 1933 the club was changed into Betriebssportgemeinschaft Osram, a company based sports club of the lamp producer with the same name. The flag didn't really change but the inscription became "BSG" (1st line) "O" (2nd line, centred). Name: Berliner Ruderclub 'Phönix' e.V. It is a white flag divided by a white saltire, cotized light blue white blue. In its centre is a white disc surmounted by a light blue annulet with a statant griffin in the centre. Probably that griffin shall be a phoenix. The canton is a white rectangle fimbriated light blue with capitals "BR" over "PH" of the same colour. Name: Pichelsberger Rudergesellschaft 1914 e.V. t is a white flag showing a white pennant divided by seven vertical red stripes, also edged red, pointing to the fly. Within the pennant, shifted to its hoist, is a white roundel cotized red with a red capital "P". Red "R" and "G" are in the upper and lower fly. It is a white flag with two black horizontal stripes. Between the stripes in the centre of the flag is a black eagle. The canton is a white rectangle, fimbriated black with black serifed dotted capitals "R.V.P.". The colours black and white and the black eagle as well had been symbols of Prussia. Established: 10 September 1924 as Post-Sportverein Berlin e.V. The Club was renamed in 1998 to Pro Sport 24 Berlin, when German Mail, after having changed from a governmental organization to a private company, ended its sponsoring. The club had been established in 1924 as a club for civil servants working for German mail. Today the club has more than 5000 members in 25 departments, among them rowing, sailing and canouing, each of the three having an own flag. Müller claimed that the club is no.2 by number of members after Hertha BSC (football) but having the largest number of active members, i.e. without supporters all over Berlin. It is a blue flag divided by a yellow saltire. In the centre is a white shield with a blue rampant bear above a blue horn. The bear is taken from the coat of arms of Berlin. The horn was the symbol for postal service in Germany. information about sailing department is available here. Name: Ruder-Club Rahnsdorf Luftfahrt e.V. It is a red flag with two white horizontal stripes. Between the stripes is a rampant black bear, the same as in the flag of the city of Berlin. The bear is holding two white oars in its paws. The bear is superimposed by white capitals "RCR". It is a white flag, divided by four horizontal red stripes, the outer stripes are mere lines. In the center of flag is a white isosceles triangle, fimbriated red, pointing to the fly and touching both outer stripes with a red capital "R". Name: Rudergemeinschaft Rotation Berlin e.V. Rowing after WWII was done in Schmöckwitz in 1948, using the boat house of former rowing club "Burgund" (flag unknown). In 1949 the "Sportgemeinschaft Rauchfangswerder" was established, which was integrated into "BSG Rotation Berlin" in 1950. The club moves to Berlin-Karolinenhof, using the boat house of former rowing club "Preußen" in 1954. Since then it is sponsored by "Berliner Verlag", a little bit later by "Verlag Neues Leben", both publishing houses. Since 1959 the club is sponsored by "Berliner Druckerei", a printing company, until its dissolution in 1992. After German reunion meeting with members of rowing club "Preußen", located in West-Berlin and restituted as owner of boat house. Begin of cooperation and friendship. In 1990 the club is renamed into "SSV Rotation Berlin" and applies for membership in the Berlin section of German rowing association DRV. 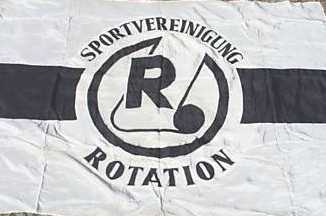 In 1991 the department rowing of "SSV" left the club and is re-established as a mere rowing club, calling itself "Rudergemeinschaft Rotation Berlin e.V." After negociations with "Preußen", which was still owner of boat house, there was a treaty in May 2003 and "RG Rotation" became owner of the boat house on 22 September 2003. We learn that sports associations (SV's) were organized on professional production lines in 1951 - 'Rotation' being meant for publishing and the printing industry - and uniting sports clubs of various kinds but retaining the link with their labour backgrounds. It is a white flag, divided by a broad black horizontal line, cotized white and black. In it's centre is a white roundel cotized black with a black "R" and a black disc with a black line upward and a horizontal line embowed at its end. 'ROTATION' (i.e. rotary [press] ); the gap in the rim is caused by the representation of a broad sheet of paper drawn out from a roll; for good measure a black initial 'R', serifless, is placed in front of the sheet of paper. You could even say that the second letter of the name 'O' is recalled by the roll. The left rim in the flag of RG Rotation is superimposed by the "R" however. An image of the logo can be found here. It is similar to the 2004 version. The bar is not cotized. The 2nd rim of the sheet of paper can be seen. The logo is surrounded by an inscription of the name in black capitals. to previous page click here. to next page click here. back to German Rowing Clubs in Berlin main page click here.